Big HUGE thanks to everyone who participated in the 2009 Kitchen swap. The blog roll list is still up on my sidebar for everyone to view the goods. Despite all the work, I really had a ton of fun with everything. I have met some wonderful bloggers as well along the way. 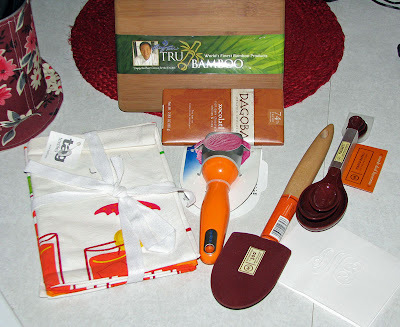 This was my loot from the swap (see picture above) I had 2 fabulous partners. Although because I was the host, I didn't have a lot of chatting time with them, I do hope to get more chatty time in with them in the future. I would love to hear every ones wonderful stories maybe on what you got, or how it made you feel, did you meet someone really cool? Also check out our flicker group here and share pictures of all of your wonderful items. If you have not yet received your package please let me know, and I will post a list for you and try to contact your partner. Thanks again everyone, it's been a lot of fun. This was from Jenelle over in Australia. She is a super talented crafter as well as a fellow etsian. 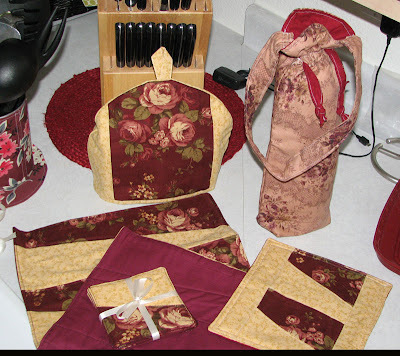 Included in this swap box was a beautiful set of handmade coasters, with a matching table runner, pot holder (trivet), teapot cozy, and wine bottle holder. I am not sure if I told her how much I love wine, but she knew. What a great idea. Jenelle had to think outside the box on mine which I very much appreciate. She is a shabby sheik kinda person and works a lot with soft colors. I am glad that she took my red and mustard yellow request so far. I feel like I should clean my kitchen now to display all the pretty stuff from Jenelle. Jenelle thanks so much for all the work that you put into my package it was wonderful, I hope that you loved yours just as much. Check out what she got here. My second partner's stuff arrived today. It was Jennifer from Texas. Jennifer is an entertainer, she loves to give small parties in her home. She also loves to shop LOL so I made out like a bandit. I absolutely love love love the orange ice cream scoop, and the bamboo cutting board will be perfect for cutting fruit when the girls come over for cocktails. She also sent me some measuring spoons, a rubber scrapper, and some super cute bar towels, as well as some yummy chocolate. (I think it has hot peppers in it). Jennifer is not feeling well right now so if you get some time, stop over by her blog and give her some warm wishes to get better. Jennifer I love everything you sent, even if you didn't make it your self I am still glad that you love to shop. Thanks for a great swap box. Hope everyone had as much fun as I did. very nice swap that you received. I sent mine to Mindy around the 25th of May, have not heard from her at all. I'm so glad you liked your goodies Terri. It was hard to work with colors that are not the usual for me, and wondering whether you would like it or not. 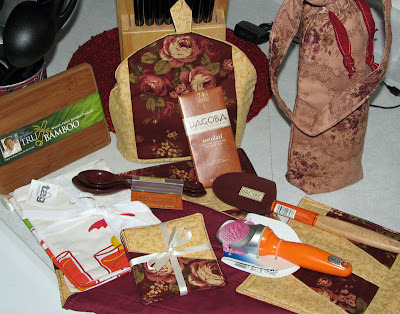 You did mention that you liked wine lol, and the wine bag was a last minute item I put in. Thank you VERY much for organizing the swap. I had a great time! Many thanks for a wonderful swap!! !